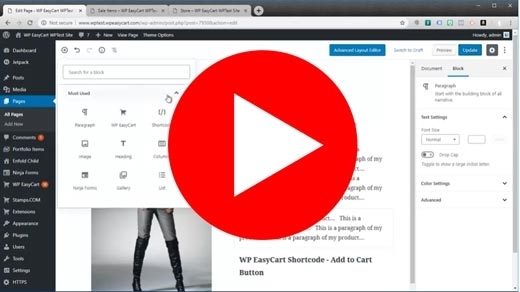 WordPress 5.0 is out and EasyCart offers blocks to build your site... learn more in this newsletter on using this new platform. With the new Gutenberg editor, it can be confusing to use and we want to give a quick guide on using the new editor. The new Gutenberg editor is a visual page builder designed to allow you to easily build column layouts and add modules such as text, images to page. We have found it frustrating to use, and many of you have as well. After using such great page builders as those from themes such as Enfold, Divi, and Avada, it may seem like a step backwards. The lack of module borders makes it very hard to define where a module starts and ends. BUT, fear not, WP EasyCart does offer some blocks in this new page builder system to make your page building easier. Note: You can still choose the classic editor if you do not want to use Gutenberg. When selecting a new block to build, you will notice a + Plus icon as you hover your mouse in the spaces on the page. This allows you to add modules or 'blocks' to a page. You can add column layouts, and then add components like text boxes, images, paragraphs, buttons, and more. Here we are selecting the 'WP EasyCart' block that will appear as a shopping cart icon. WP EasyCart lets you add all kinds of blocks to the page. These are simple shortcode that allow you to show products, add to cart buttons, stores, accounts, and other components to a page. Shortcode is a very simple code injection system, where WordPress allows developers to build code and drop them into a page with little codes formatted with  brackets. For example, shortcode [ec_store] will show the entire EasyCart store product grid on any page. Or [ec_account] will show the entire EasyCart account login and registration system. Choose the WP EasyCart block, and you have access to a variety of shortcode all with a drop down interface to select which shortcode, products, and features we offer... VERY EASY! Store Block – This type of block will display a grid of products just as your store would show. You may filter it to show specific categories and groups of products. Cart Block – This type of block will display the standard shopping cart with all the users products, subtotals, checkout buttons, coupons, gift cards, and such that you setup within the standard settings -> checkout screen. Account Block – This will display the standard login or create account screen associated with an account. You can also setup a redirect URL if you wanted this to be a part of a membership system where users go directly to a set page if using this login link. Category Standard Display Block – This block allows you to have a page with all of your categories displayed in a grid layout. For example, categories for tshirts, pants, shoes would all be displayed here instead of products. Store Table Display Block– This block allows you to design a 5 column table layout of products. It works like a spreadsheet and you can add only specific products & categories, as well as control what the 5 columns labels and content contain. Choose to show the product ID, Title, Price, available quantity, and a link to view more details in a spreadsheet table. Product Display Block– This block lets you show a single product. This is not the product details, but rather a single product from the normal store grid. You can choose to display it as the default store design, or as a sidebar widget design, or custom display type 1. Add to Cart Button Block – This block allows you to add a products add to cart button behavior to any page or block location. This is a great block if designing your own product page and then want to link it to a product for easy ‘Add to Cart’ behavior. The block will automatically show option sets if your product has them, as they would be required to add to cart. It also displays the product’s price. You can easily use custom CSS to hide parts of this add to cart button should you want to customize further. Cart Display Block – This is actually just the Cart Block, but without all the checkout and subtotal information. It will display a full list of products the user has in the cart ONLY. Membership Content Block – This block allows you to have membership content and nonmember content within a block. Simply select your product that the user must have purchased and the membership content area will display if they have it. You may alternatively use the sidebar on the right side to choose to block the entire page based on product, subscription, or membership. To help visualize the process of using the new WordPress editor, watch our short design video that walks you through this page builder. 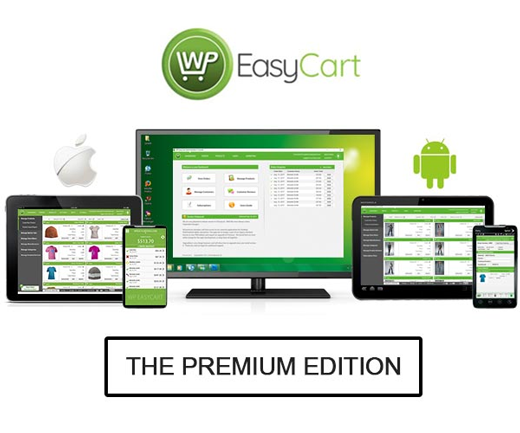 WP EasyCart Premium provides a full eCommerce solution to any WordPress website. Sell any type of good, retail, downloads, services, invoices, gift cards, and more.